From 'Abdon - the Church and it's local history'. The Church of St. Margaret dates back to 1138 but, except perhaps for the thick walls of the nave, none of the original fabric remains. In 1737 a sum of £1,120 was necessary for repairs and many features of the present building date from then. More alterations were made in 1860. The gallery at the west end was taken down, the nave extended, the bell-gable rebuilt, and several windows inserted. The only original window is on the south side of the chancel in the 14th century decorated style of architecture. The cast window was placed there by the Rev. W.S. Dear during his rectorship 1829 - 1850. Two other windows have been added: one at the west end of the north wall in 1909 and the one opposite in 1910. The font is early English 12th - 13th century. There were three bells in 1740 and until 1860. The present pair are dated 1859 and 1860. The Communion Plate was the gift of a Mr. Styrrop, a pupil of the Rev. W. S. Dear. Glebe is an area of land within an ecclesiastical parish used to support a parish priest. In 1932 there were twenty 'Medows', 'Yards' and 'parcels' of land. Several of their names are of interest. They include a Hemp-yard, hemp being grown in this area more than 200 years ago; The Furlong, bounded by Cobblers Lane; a Nell-Yate Leasow (a pasture) and Nell-Field. Furnace Lane and Norcott's Brook are also mentioned. During the Rectorship of the Rev. John Ball, around 1700, hay, grain, apples, pears, hemp and flax, pigs, lambs, geese, 'egges' and honey, and 'sheeps wooll' were paid in kind. The 'customs' (taxes) were 'for the fall of a colt - one shilling; for the fall of a calf - four pence; for the sale of a sheep - a halfpenny; for the milk of a cow - one penny; for Easter - oblations two pence each communicant'. The present Rectory ceased to be occupied as such in 1928 when the Benifice was united with that of Clee St. Margaret. 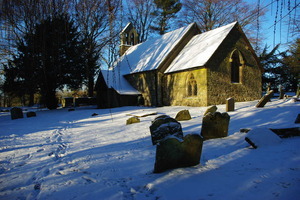 Since 1983 it has been associated with the Corvedale churches. Between December 1947, when the Rev. Lewis, who was minister for both Abdon and Clee St. Margaret retired, and 1983 Abdon was served by a priest in charge. For several periods between 1551 and 1780 Abdon Benefice was combined with Clee St. Margaret. In the Summer and Autumn of 1999 the roof of the nave at St. Margaret's Church, Abdon was renewed by a team of 5 volunteers, supported by their families and friends. A video of this called 'Raising the Roof' has been compiled by Mr B Wilson.